Chadron Middle School will represent well at the State National History Day competition this year as 14 students and 7 projects placed at the regional competition today. Congratulations to the state finalists and to all of the students that participated! 1st Place Group Exhibit: Cuban Missal Crisis - Mande W. and Bailey R.
2nd Place Group Exhibit: Elizabeth Cady Stanton - Lauren C. and Grace S.
1st Place Documentary: Civil Rights/Jackie Robinson - Keelynd C. and Shawn G.
2nd Place Individual Exhibit: International Space Station- Sydney B. 1st Place Group Performance: Bly & Bisland - Abby H., Claire M., and Shelby B. 2nd Place Group Website: Bartolome de las Casas - Kellie W and Anabel G.
3rd Place Group Website: John L. Sullivan - Abby G. and Maddie S.
1st Place Group Website: Brown v. Board of Education - Hunter H. and Brooklyn S.
1st Place Individual Exhibit - Veronica P.
Shelby, Claire, and Abby practice their original play, based on Nellie Bly's and Elizabeth Bisland's race around the world, in front of their social studies class. 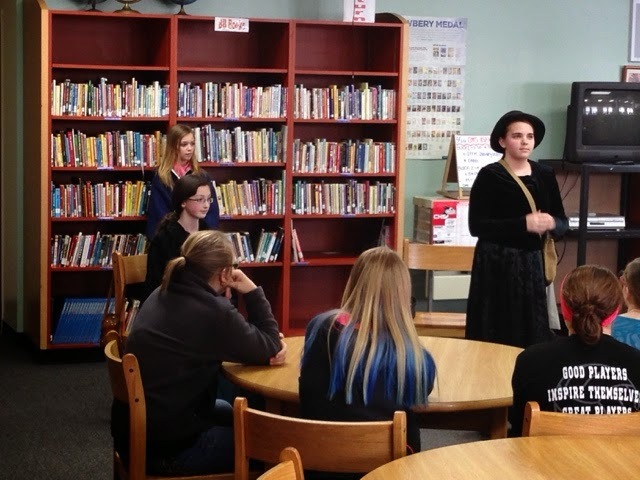 National History Day Regionals take place tomorrow, February 27th, at Chadron State College. Chadron Middle School has 23 students participating! I will be hosting two informational parent meetings to discuss the middle school's proposal to move to an A/B block schedule for the 2015-16 academic year. 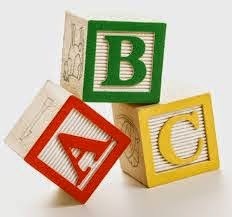 The purpose of the meeting is to explain the rationale behind exploring an A/B block schedule, the steps that have been take up to this point, explain how an A/B block schedule works, discuss the pros and cons, and answer any questions that parents may have about it. The 6th and 7th grade parent meeting will be held on Thursday, February 26th at 5:30 in the middle school library. The 4th and 5th grade parent meeting will be held on Thursday, March 5th at 5:30 in the middle school library. I hope that these dates work with your schedule. If not, please feel free to contact me at the school to set up a meeting to discuss the A/B block schedule. 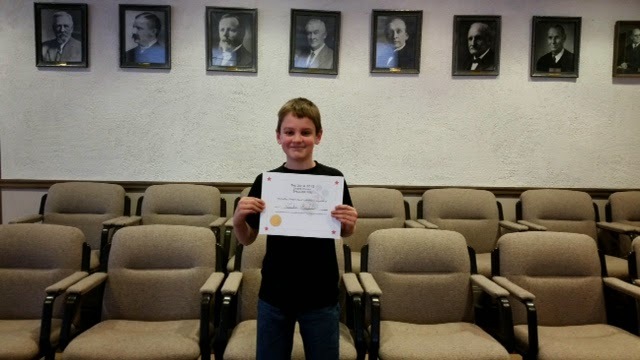 Congratulations to Luke Kahl for winning the Dawes County Spelling Bee on February 19th! On Wednesday, January 21st, Chadron Middle School hosted it's annual National Geographic Geography Bee. Dylan Gielser was the 5th grade champion and overall champion. The 6th grade champion was Kennady Stack, 7th grade champion was Wren Chamberlain, and the 8th grade champion was Erin Kadlecek. Congratulations to these students on this outstanding accomplishment! On Tuesday, January 13th Chadron Middle School held it's annual History Bee competition after school in the CMS library. Kayley G. (6th grade) was the over all champion. Kayley, Clarie Margetts, Jake Lemmon, Ozzy Fernau, and Hannah Walker also qualified for the Regional History Bee, which will take place in Denver on March 4th, with their outstanding performance on the written test. Congratulations to Chance Nuno (8th grade) for winning the Chadron Middle School Spelling Bee on Thursday, February 5th. The second place winner was Zoe Bagneschi (5th grade) and the third place winner was Luke Kahl (5th grade). All three of these students have qualified for the Dawes County Spelling Bee, which will take place on Thursday, February 19th at 2 PM at the Dawes County Court House. Here is a list of upcoming events at Chadron Middle School for the next two weeks. Please note the days that are in bold letters as they are early out and no school days. Chadron Middle School will host parent-teacher conferences on Thursday, February 12th from 2:00-8:00 PM in the middle school gym. Teachers will have a 1-hour dinner break from 4:30-5:30, so please plan accordingly. If you would like to schedule a meeting with your child's teachers outside of parent-teacher conferences, please contact the school at 432-0708 and the office will leave a message with teachers. As a side note, there is also a district-wide 1:30 dismissal on Friday, February 13th. On February 13th, Trooper Chuck Elley, retired State Patrol Officer, will talk to our 7th and 8th grade students about the dangers/legalities of Cyber Bullying, Cyber Predators, and sexting. 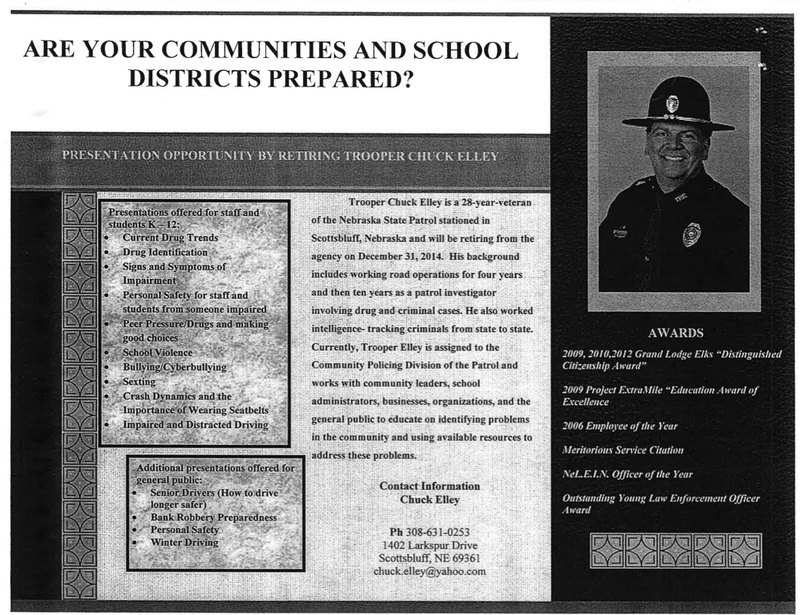 Trooper Elley has presented to thousands of students across the state on a variety of topics that affect kids today. The presentation to our students was made possible by funding from outside of the district. Parents are welcomed to attend the presentation, which will be at the CHS Auditorium from 9:30-10:30 on February 13th.